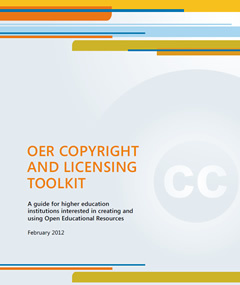 This toolkit is aimed at higher education stakeholders who are working with Open Educational Resources (OER). It explains the notion of copyright and describes the different licensing options available to the author/creator of a work. Whether you are wanting to license your own work, or are tasked with clearing copyrighted documents, you will find comprehensive information about the basic concepts in copyright and licensing, the types of open licences that exist, and tools and techniques to provide support. The person who creates the work is termed the author or creator – which includes writers, musicians, artists, scientists, programmers etc. Copyright is not always held by the author of a work – in that case, we would talk about the ‘copyright holder’ or the ‘copyright owner’. The copyright holder of a work is sometimes the publisher rather than the author. The licensor is the person or organization holding the licence to a work. This might or might not be the author of the work. The licensee is the person who seeks to use the licensed work or to whom a licence is granted. The toolkit has the following sections. You can read through them all in sequence or just go straight to the issue that interests you. Each section comprises sub-sections that provide more detail on the focus issue.